This is the first part in our guide in getting Watchguard Single Sign on working in your active-directory environment. A quick introduction here might be needed. Watchguard routers have a fantastic set of tools for reporting and controlling user access, dataloss prevention, IPS and Malware protection but applying these rules to groups of users can be a very intrusive process. Say for example the HR deptartment needs access to a job listing site like seek.com.au but no other staff require access. You can apply polices based on groups, however the Watchguard needs to know who is who. Forcing users to attempt connect to the web, get redirected and authenticate on the proxy web page and then resume their activities. This has the habit of breaking things like Outlook and Lync as the Proxy presents an SSL certificate that’s not expected. This page, gets really really old. There are 3 solutions to this. This isn’t really a solution for end users, but fantastic for servers and appliances that need access to WAN resources. 2.) Watchguard XTM Authentication Gateway without SSO Agent. This installs on a server in your infrastructure and will attempt to open the event viewer of any machine that uses the proxy to see what AD controller they authenticated against and is usually pretty reliable after you push out some firewall exclusions. 3.) 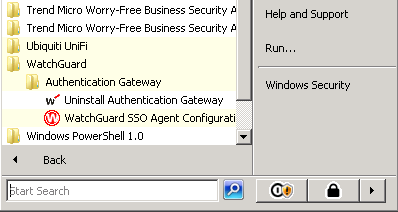 Watchguard XTM Authentication Gateway with SSO Agent. This is the method I prefer to use. The Watchguard will look for the SSO client before falling back to the event log method. So if for some reason the SSO service stops the user isn’t completely cut off. In all cases the Watchguard will eventually failback to forms based authentication if none of the above methods work. This will throw an “invalid SSL error” to your clients unless you correctly install a trusted SSL cert in your device. If you already have software deployment polices there is no need to configure new shares / GPO’s you should just be able to edit the existing ones. 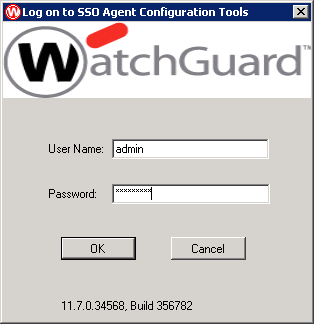 Head on over to Watchguard and login to their website. In the Knowledgebase under software downloads for your appliance you will find the downloads for the SSO Agent and Client. Make sure you download the Client MSI and not run it, and lastly if you have a Terminal server you will need to download and install the “Terminal Services SSO agent” to differentiate between users on the same box. Grab these files from the Watchguard partner portal. 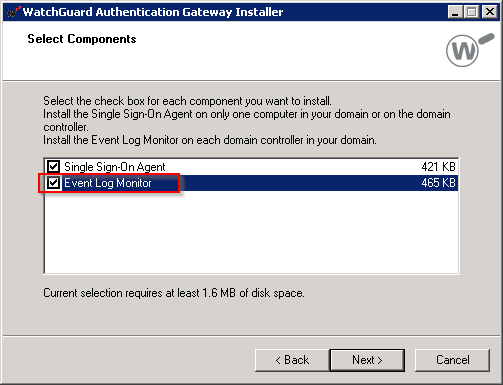 Once the downloads complete kick off the “Wg-Authentication-Gateway_11_7.exe” on your domain controller, Follow the bouncing ball and ensure you tick the “Event Log Monitor” option. 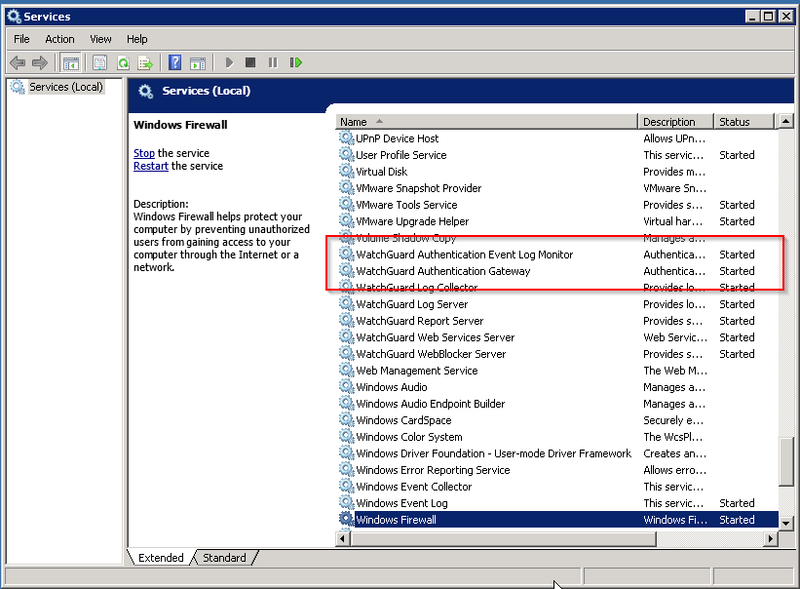 Note: You need to install the “Event Log Monitor” on every domain controller but the agent should only be on one as this is the server the Watchguard will connect to submit lookup requests later. Make sure to select the Event Log Monitor. Continue through the installation until you are asked for logon credentials. 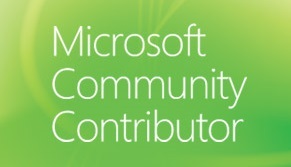 As the blurb states the user must be a member of the domain admins group and must have the “Logon as a service” right. You should have a dedicated account for these sorts of things already if not, quickly spin one up now and make sure the password never expires. Additionally ensure you enter the username in domain\user format. Enter the details in Domain\Username format. Once the installation completes, verify the services are running by clicking Start and searching for “services.msc” Run this and scroll down to the Watchguard services. You should see “Started” next to both the “Watchguard Authentication Event Log Monitor” and the “Watchguard Authentication Gateway” if not check the account you specified during setup is a member of Domain Admins and has the “Log on as a service” right. Make sure the services are started before continuing, if not check your user accounts. 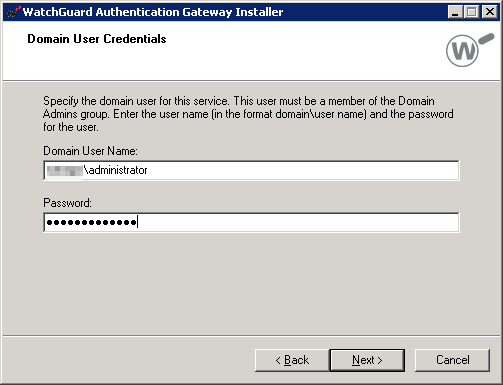 Start the SSO configuration application under the Watchguard section of your start menu and login. and Login to the configuration interface. The first thing you will want to do is change the passwords, head over to “Edit > User Management” and update the passwords in there. Keep in mind the configuration tool doesn’t allow you to paste a password upon login, so generate a password that you can actually type. Now you need to configure the SSO agent lookup and Event log monitor. 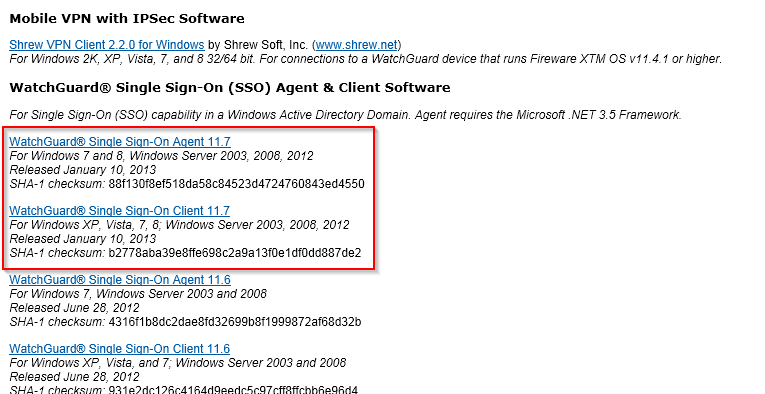 In the “Edit > Clientless SSO…” dialog box you can see the order that the Watchguard will attempt to authenticate users. You can leave this as the default as it’s pretty reliable. Down the bottom of the window you will see a list of Domains and their associated monitors. Add all your domain controllers and their associated domains here. Domains are in domainname.local or domainname.com.au format. Once you leave this window your settings will autosave. Remember: You need to have the event log service installed on ALL your domain controllers for the domains you want to authenticate. Next you want to configure the actual AD agent. Head over to “Edit > Add Domain…” and fill in the domain details. Note: Entering a bad username and password will cause a popup advising the UPN you entered is invalid.. Check the password too! 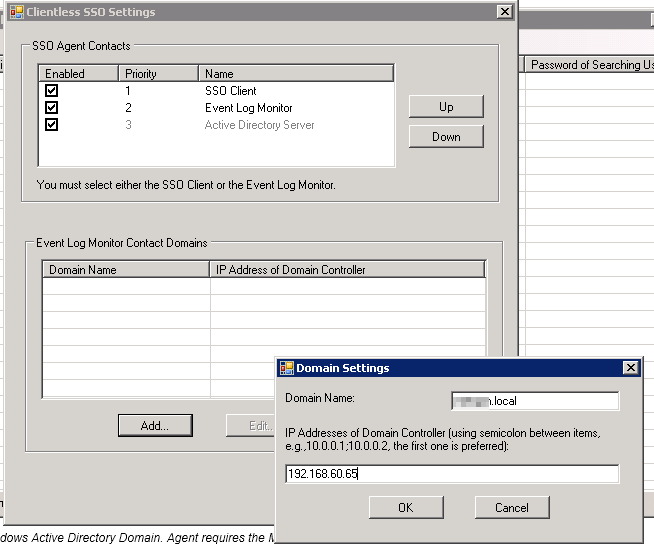 Configure your domains in the SSO agent to allow authentication. Add any additional domains using the same manner, once finished exit the Admin config tools to automatically save your changes. 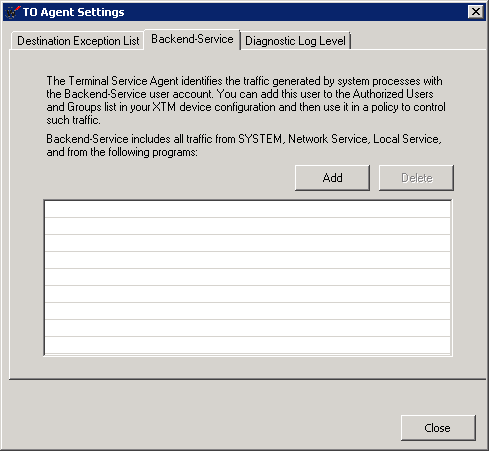 If you have any Terminal Services or Remote Desktop servers in the domain it’s a wise idea to install the TS Agent to allow multiple users on your TS/RDS box to authenticate. Otherwise the Watchguard appliance will treat all traffic from that server as the same user. (The first to logon after a timeout) This causes 2 problems. Group based policies won’t be applied correctly and reporting will be skewed. On each of your Terminal Servers, Switch over to application install mode by running an administrative command prompt and running “Change user /install”. This allows any changes you make on the TS box to apply to all users, not just the admin sandbox. Locate and run “TO_AGENT_SETUP_11_7_4.exe” from your earlier download and follow the bouncing ball. 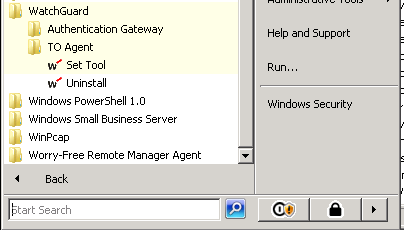 Once installed you will find the configuration tool in your start menu under Watchguard > TO Agent. You can find the TS agent in your start menu. Run “Set tool” and update the configuration as needed. Destination Exceptions: For anything you want to be excluded from the Watchguard entirely. Note: System, Network Service and Local Service are already excluded. Diagnostic Log Level: There is no need to adjust this unless advised to do so by Watchguard support. Any rules that require a user to be logged in on the Watchguard will be skipped, if the traffic hits the end of the rule list it will be denied, so make sure you put a rule with the servers IP as a valid source in your Watchguard. Once this is all complete, Kick off another command prompt and run “Change User /Execute” to put your session back to normal. Rinse and repeat the above for each Terminal Server in your domain. Yes. sorry I’ve been quite busy of late with a few Lync 2013 deployments (as well as Watchguard reverse proxy) and my home lab dying. Expect to see the rest of the blog next week. Hi Nicoli. Part 2 has been up for a couple of days now. I expect Part 3 to land in a day or two. The Watchguard documentation is great, but it’s hard to find deployment guides like what you’ve done here. The information is in lots of different places… and it’s hard to figure out where to start and how to bugtest. 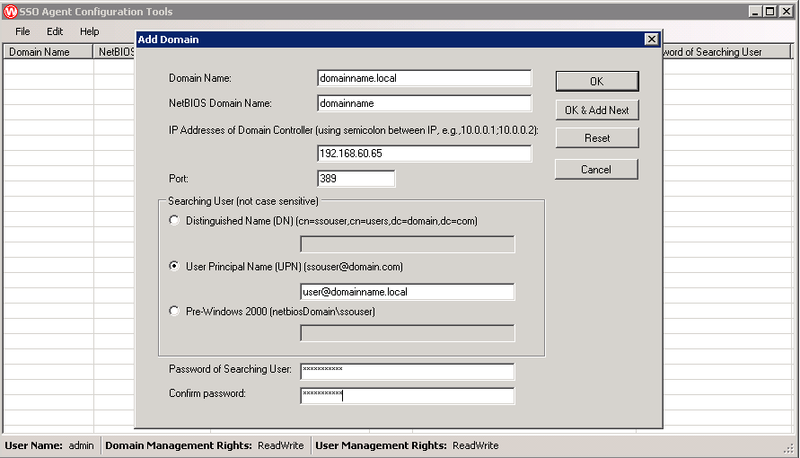 Easy enough for a Windows Domain and I see v11.8 supports OSX… haven’t seen any iPad/Android apps released yet however. Implementing this in to BYOD would be ideal. Part 3 (soon) mentions this re:11.8.. I’ve heard some rumors that mobile devices will support SSO via Activesync in a newer 11.8 release so no apps to install. An interim solution would be to stick your BYOD appliances into a DMZ wifi network and deploy the WG VPN to them. I wont cover it all here but basically you email your users a link and attachment. the link redirects them to the app for their platform. They then open the attachment and the WG app configures the VPN for them on the device. Once they connect to the VPN they are now an authenticated user and can be treated as such, just be aware of the extra load on your appliance. 11.8 SSO Agents are now online. Adds an SSO Client for Mac and the Exchange Monitor to capture anything checking for email. Might need a part 4? With BYOD, I have made a user/pass that is in the Restricted AD Goup and is shared out to guests to the campus (not ideal I know but I don’t need the extra load on my XTM). I haven’t worked out how to deploy Watchguard certificates on users BYOD devices yet, but I’ll keep picking at it so I can avoid having to make users deploy the VPN client. In January next year I will be putting in a Layer 3 switch at the core and VLAN’ing off guest wifi access so users do not see the SSO Authentication page but still get the same HTTP/HTTPS policies as the Restricted AD group. This is looking like a really solid setup so far; I’m glad I went through with SSO deployment as it’s added A LOT of highly configurable options for managing policies on the XTM.